Canoes jumped off the line in the first heat of the Girls 15 race at Nanakuli yesterday. Father's Day turned out to be an unusual one for the clubs competing in yesterday's Oahu Hawaiian Canoe Racing Association regatta. Big waves at Nanakuli Beach Park wreaked havoc on paddlers, forcing the course to be cut in half before eventually deeming the Father's Day Regatta unofficial at the conclusion of the youth races. Most of the big clubs called it a day, but Leeward Kai and some of the smaller clubs raced in the remaining events and were rewarded with medals for their top finishes. 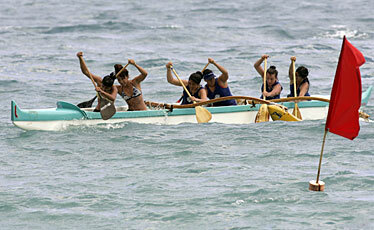 Healani's girls 18 division crew paddled to victory yesterday during the Father's Day Regatta at Nanakuli Beach Park. Big waves and rough conditions didn't damper the four clubs that stayed through the end of yesterday's Oahu Hawaiian Canoe Racing Association's race. After the Father's Day Regatta at Nanakuli Beach Park was made unofficial after water conditions forced the race to be modified, most of the bigger clubs decided to call it a day. But host Leeward Kai and small clubs Keola O Ke Kai, Keahiakahoe and Hui Lanakila stuck around after the youth races were completed and were rewarded by earning medals they generally would have a hard time winning. "It was a battle and there were a lot of hardships," Leeward Kai coach Rena Rzonca said. "Bless the hearts of those who stayed and supported us." Kailua, who had finished second to Lanikai in the first two races this season, stayed long enough to win the AAA division with 87 points. Leeward Kai nearly doubled its highest point total of the season with 66 to take the AA division for the first time, and Honolulu Pearl Canoe Club and Keola O Ke Kai tied with 19 points to win the A division. "We have to compete against some good teams, so this is something that doesn't usually happen," Rzonca said. Jen Romano and her family started club Keola O Ke Kai seven years ago and first joined OHCRA in 2005. Yesterday was the first win in the A division and the club won the men's junior race and placed second in the 18-and-under boys, men's open four and the men's and women's mixed events. "It's exciting for all of us," Romano said. Romano said her team stuck it out and competed not only for the thrill of competing, but also to show support to the host club. "We've put the time and effort and money into it and plus, we wanted to show our support for Leeward Kai," Romano said. "We're already out here anyway, why not stick around and enjoy a sport that we all love." 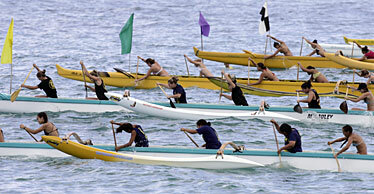 The day began with youth races competing in 12 lanes on the rough water along the Nanakuli coast. After big swells at times had half of the lanes under water, officials modified the course to a six-lane format with each event taking two heats. The big waves continued, eventually damaging one of the koa canoes, forcing clubs to switch to canoes made of fiberglass. Once the 18-and-under girls race was completed, officials determined the regatta wouldn't count toward the state championships and cut all the races down to a half-mile in length. The Waikiki Beach Boys won the overall championship in Hui Wa'a's Windward Kai Regatta yesterday. The Beach Boys, competing in the AA division, won the last race of the day (open mixed) to beat Kaneohe (AAA division) by three points, 74 to 71. Kaneohe captured the AAA division, and Manu O Ke Kai took second with 68 points. Na Keiki O Ka Moi (41) took second in the AA group. Ka Mamalahoe scored 13 points in the A division to beat out Kalihi Kai (11).